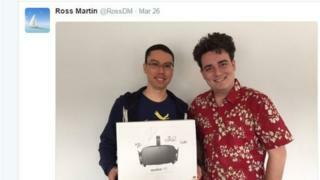 The founder of VR (virtual reality) firm Oculus has hand delivered the first Rift headset to a customer. Palmer Luckey handed over the headset a couple of days before the consumer version of the Rift is officially due to start reaching customers. The recipient was Ross Martin from Alaska who ordered the headset when pre-orders opened in January. Mr Luckey said he wanted the "satisfaction" of delivering the first Rift headset. On 28 March, the consumer-ready Rift headsets should start to reach people who were among the first to order it in January. Before now the only versions of the headset available were made so developers could familiarise themselves with the software and hardware in the device. The consumer-ready Rift has improved lenses and electronics to make VR as immersive as possible. Mr Luckey said it was important to him to hand over the headset given that he had been involved in its development since 2009. "I'll be damned if some random delivery guy is going to get the satisfaction of delivering the first Rift," he told game news site Polygon. "That's mine." A video of the handover was posted to Mr Luckey's page on Facebook. Oculus was bought by Facebook in March 2014 for $2bn (£1.41bn). Mr Martin said he had no idea that his headset was going to be handed over by Mr Luckey. He said he received an email saying it would be delivered on Saturday but assumed everyone who pre-ordered got the same message. It was only when he rang to confirm delivery that he realised who was handing it over. Mr Luckey said he only had one regret about the stunt, which was wearing flip-flops while walking around in Alaska during the winter. The Rift is the first of the sophisticated consumer-ready VR headsets to reach customers. A rival device from HTC is set to reach people in April and the headset for Sony's PlayStation will be available in October. The PlayStation headset is the cheapest of the three, retailing at $399 in the US and £350 in the UK. By contrast the Oculus costs $599 (£499) and the HTC $799 (£689).